Avg. Group Discount of 30.1%! With a one-of-a-kind location, first-rate facilities and unmatched value, it's easy to see why Golden Nugget Atlantic City attracts so many meeting and event planners. Enjoy flexible conference and banquet space, comfortable accommodations, creative cuisine, attentive guest service, gorgeous marina views and an incredible array of bond-worthy activities. From corporate retreats, investor meetings and team-building events to bayside weddings, reunions and social events, we are ready to see to every detail, so you can focus on your guests.Dining at Golden Nugget Atlantic City is always an extraordinary experience, whether you're craving an elegant steak dinner, endless buffet or a casual bite on the water's edge. With eleven dining experiences under one roof, including several signature restaurant concepts, we can handle any hunger you bring to the table. You'll also find your favorite casino games, nightlife, shopping, shows, friendly staff, a AAA Four Diamond rating, and a relaxing marina setting away from the bustle of the Boardwalk. Hotel Features – The Trump Marina Hotel Casino is a high-rise hotel that’s just a mile from the Boardwalk, adjacent to the Frank Farley Marina. It features 728 guest rooms, all with marina, city, or bay views. It also boasts more than 200,000 square feet of combined meeting space and high-speed Internet access in all public areas. Guest Rooms – As a guest of the Trump Marina Hotel Casino, you can choose from a variety of guest rooms, including the Bay Tower Rooms, Junior Suite, and Marina Suite. All guest rooms feature an iron and ironing board, hair dryer, high-speed Internet access, on-demand movies, games, and digital music. The suites offer more luxurious amenities, such as an executive desk, marble bath, and plasma television. Nearby Attractions – The Trump Marina Hotel Casino is in the heart of all Atlantic City has to offer. You’ll be less than two miles from the Atlantic City Aquarium, Atlantic City Convention Center, Atlantic City Historical Museum, Garden Pier, Monopoly Monument, Ripley’s Believe it or Not Odditorium, and more. Perks & Amenities – Trump Marina Hotel Casino is the ideal choice for a hotel if you want access to endless entertainment and dining opportunities. From an upscale steakhouse to modern Chinese cuisine, the hotel boasts nine restaurants for you to choose from. The property is also home to four music venues that draw entertainment from all over the world, a nearly 80,000 square foot casino, and a health spa that offers specialized treatments and fitness equipment. Finally, the property offers a Trump Shuttle, exclusive to Executive and Chairman Club members, that can take you throughout the city with stops at Trump Marina, Trump Plaza, and Trump Taj Mahal. Expert Tip – Be sure to check out the many shops near the Trump Marina Hotel Casino. They offer everything from red carpet-worthy jewelry to maps and munchies you can take out on the water. Take a break with a dip in our sparkling pool. Located on the 6th Floor rooftop, the seasonal H2O Pool deck offers fun seekers a refreshing escape. Sleek, upscale furnishings in a vibrant red, orange and yellow palette contrast with the breathtaking views of the Atlantic City skyline. Cabanas, daybeds, hot tubs, fire pits, conversation areas and the adjacent H2O Bar all come together to create your perfect summer oasis. Cancellation of individual reservations not received by Golden Nugget at least 48 hours in advance of arrival will be charged one nights room revenue. This charge will be applied to either the individual's credit card or the group master account. Start your day with a hearty breakfast from room service or dine at one of our many restaurants. Prices vary by outlet. Complimentary garage or valet parking is available. Complimentary wireless internet access is available in all guest rooms and public areas. 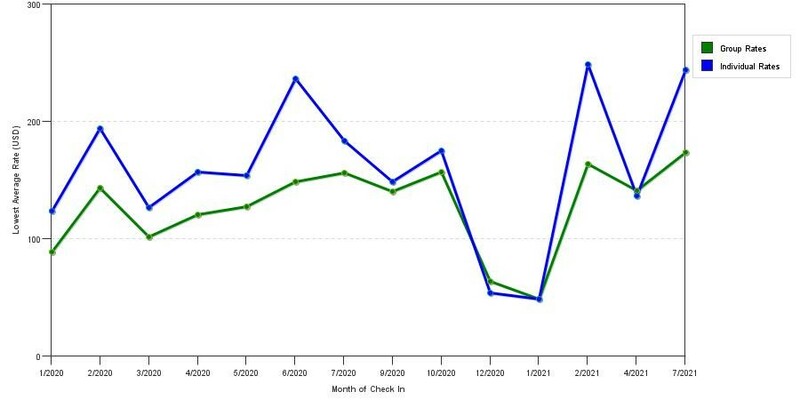 The graph above is seasonality of room rates for both our group quotes and the lowest online individual rates we could find at the time the group/meeting offer was entered. The best group deal shown is 43.7% in November 2018 and the highest average individual rate is $275 in the month of July 2019. This chart will show past seasonality and also project future months. If you are flexible with dates, you may want to consider staying at Golden Nugget Atlantic City in a month when rates are lower. 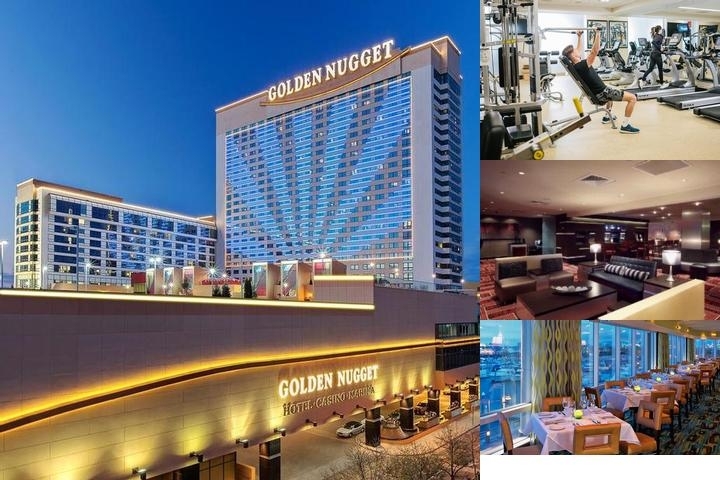 Below are the meeting, banquet, conference and event spaces at Golden Nugget Atlantic City. Feel free to use the Golden Nugget Atlantic City meeting space capacities chart below to help in your event planning. Hotel Planner specializes in Atlantic City event planning for sleeping rooms and meeting space for corporate events, weddings, parties, conventions, negotiated rates and trade shows. 137 x 123 x 19 Ft.
Meeting space pricing is negotiable based on food and beverage revenues. 98 x 52 x 8 Ft.
31 x 69 x 8 Ft.
18 x 38 x 8 Ft.
19 x 53 x 8 Ft.
21 x 17 x 8 Ft.
22 x 26 x 9 Ft.
80 x 60 x 25 Ft.
Beautiful room adjacent to the Marina with gorgeous views of the Bay. 79 x 28 x 13 Ft. 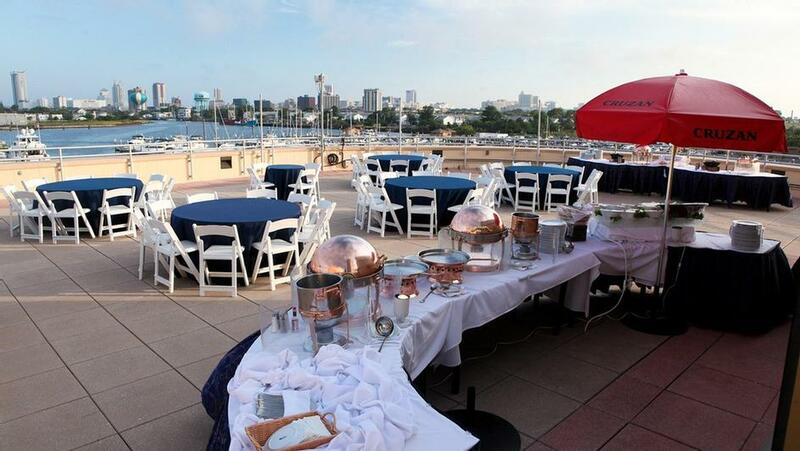 Outdoor function space with breathtaking view of the Atlantic City skyline. 260 x 57 x 0 Ft.